The cold start of 2017 caused a 20 per cent higher gas transport, compared to the same period in the last three years, according to estimates published by GIE today. Persistent cold weather, in many parts of Europe is the main contributing factor. In Spain, gas demand was the highest in five years, reaching 1502 GWh on one day last week, as well as in Italy, where the demand reached a peak of 4.503 GWh on 11th January with an average of 4.100 GWh per day in the last 10 days, the highest level in the last five years. Europe’s Gas Infrastructure has been designed to transport energy over long distances and across borders, being capable of responding to large changes in demand in a most cost-efficient manner, important features the electricity system is missing. 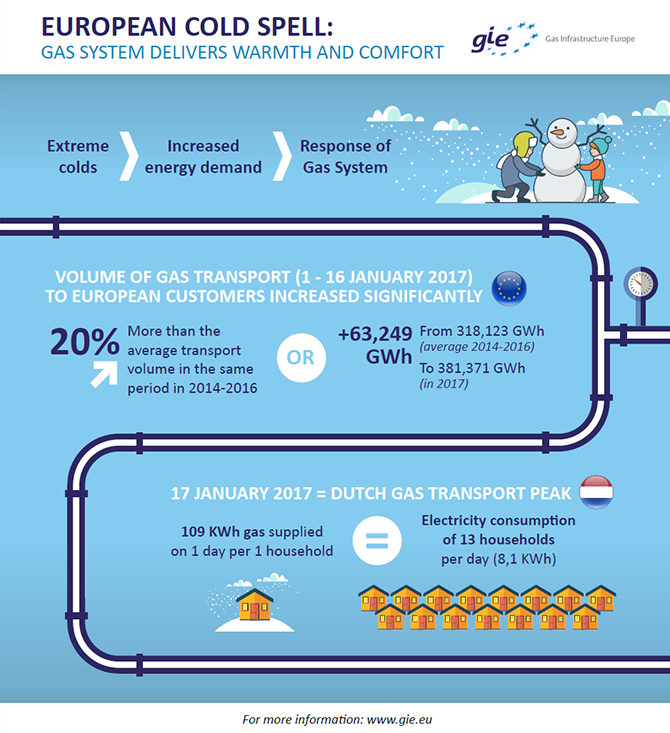 Gas transport in the EU between 1 to 16 January accumulated to 381372 GWh, a 20% increase compared to the same period in the last three years. “The flexibility of our gas infrastructure ensures that European citizens can rely on warm houses and undisturbed energy supplies, even when temperatures drop as these days” says Jean-Marc Leroy, GIE President. Alongside the vast underground pipelines system, Europe’s underground storages and LNG terminals are important elements to guarantee a security of supply that EU citizens are expecting. The gas infrastructure, storages, LNG terminals and pipelines are unique, allowing the transport of energy efficiently, providing flexibility and reliability to the overall energy system at an acceptable cost for society. “It is therefore critical that our gas system plays a central role in the transformation of our energy system we are undertaking right now”, explains Jean-Marc. As the share of renewable generation in the power system will continue to increase, the capacity of the gas system to handle fluctuations is expected to become even more important. New technologies such as hybrid gas boilers, high efficiency gas heat pumps and micro-cogeneration units are entering the market, boosting the efficiency of the gas system in heating even further. Taking advantage of these new gas technologies makes often more sense than switching to electric heating, for the environment and for citizens. As an example, on 17 January 2017, about 110 KWh of energy was delivered to an average Dutch household via the gas network. That’s the equivalent of 12-15 days of electricity supplies to the same household. The total amount of gas transported on that single day equals electricity use by 1,3 million households during a year. This illustrates the robustness of gas infrastructure as the flexible backbone of the energy system.